Summary: Introduction; 1. The Third Generation Continued: 1146√1164; 2. The Fourth Generation: 1164√1201; 3. The Fifth Generation: 1201√1223; 4 . The Sixth Generation: 1223√1246; Conclusion. 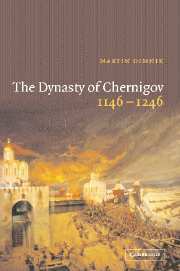 Historians in pre-revolutionary Russia, in the Soviet Union, in contemporary Russia, and in the West have consistently relegated the medieval dynasty of Chernigov to a place of minor importance in Kievan Rus'. This view was reinforced by the evidence that, after the Mongols invaded Rus' in 1237, the two branches from the House of Monomakh living in the Rostov-Suzdal' and Galicia-Volyn' regions emerged as the most powerful. However, careful examination of the chronicle accounts reporting the dynasty's history during the second half of the twelfth and the first half of the thirteenth century shows that the Ol'govichi of Chernigov successfully challenged the Monomashichi for supremacy in Rus'. Through a critical analysis of the available primary sources (such as chronicles, archaeology, coins, seals, 'graffiti' in churches, and architecture) this book attempts to correct the pervading erroneous view by allocating to the Ol'govichi their rightful place in the dynastic hierarchy of Kievan Rus'. Summary: A history of the Svyatoslavichi, descended from Svyatoslav, the second eldest surviving son of Yaroslav 'the Wise' (d. 1054). Summary: A biography of this leader of the Rus', martyred by the Tatars.